As Seattle’s population has boomed in recent years, so, too, have dog-friendly places. 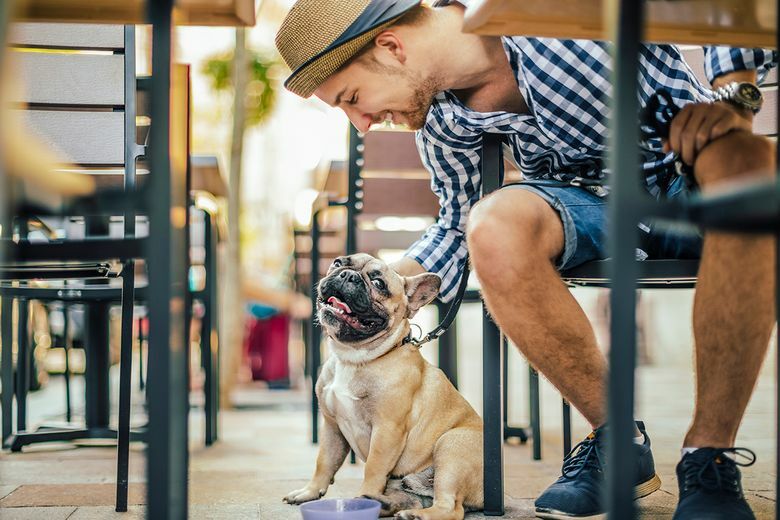 Whether spending the day at a local restaurant, going for a walk in the park or heading to work on the bus, you’ve probably noticed that Seattleites love taking our dogs everywhere. As Seattle’s population has boomed in recent years, so, too, have dog-friendly places. You can count the city’s largest employer on that list. Amazon boasts 6,000 dogs come to campus with their owners for work each day. Whether you’re new to town or a new pup parent, there’s plenty to learn about successfully getting around town with your dog in tow. Pregulman suggests a few basic guidelines when it comes to being a successful dog owner in Seattle. First, make sure to license your dog at the Seattle Animal Shelter. Second, always keep your dog on a leash when you’re out in public unless you’re in a designated off-leash area. Third, make sure you ask ahead of time whether a business is dog friendly before heading in with your dog. You can bring your dog to brunch, the coffee shop and maybe even to work, but how do you get there? The bus, of course. According to Metro Transit, dogs are allowed on board, at the discretion of the bus operator. Know ahead of time that, like at a restaurant, dogs should be able to sit quietly, be on a leash and either take a place on the floor or, if they’re small enough, on their owner’s lap. Lap dogs ride for free, but for larger dogs, be ready to pay full fare. Just be aware that drivers can refuse to let you board with a dog at their own discretion for a variety of reasons – such as if there’s a concern for the safety or comfort of your fellow passengers, or even if they already have one dog on board. And no, technically your dog can’t have its own seat. A few other of Pregulman’s favorite eateries and watering holes that expressly allow dogs are: KISS Cafe in Ballard, Linda’s Tavern and Victrola Coffee Roasters in Capitol Hill, Duchess Tavern in the University District, and Alki Cafe and Beveridge Place in West Seattle. Be sure to ask before bringing your dog inside anywhere, but your chances of being able to keep your dog with you are higher if you sit outside. “Most restaurants and bars will allow dogs on patios, even if they aren’t allowed inside,” Pregulman says. To find even more dog-friendly businesses in the area, check out lists at Seattle DogSpot and BringFido. Of course, another reason Seattle is a great place to be a dog owner is all the opportunities for beautiful walks in the city. While dogs aren’t allowed at organized athletic fields, beaches or children’s play areas in the city, they are allowed — on a leash — at most city parks. Does your dog need to run free? The city also designates 14 off-leash areas in the city. Check out FindMySeattle.com to access a map of all the dog-friendly parks across 40 Seattle neighborhoods. If you and your pup are looking for a new walking route to try out this summer, Pregulman suggests the nature-filled loop at Discovery Park, taking a stroll along the water at the Olympic Sculpture Park or scoping out some gorgeous greenery at the Washington Park Arboretum.